[prMac.com] Tokyo, Japan - Crazy Interactive is proud to introduce STCalendar 1.0 for iOS. 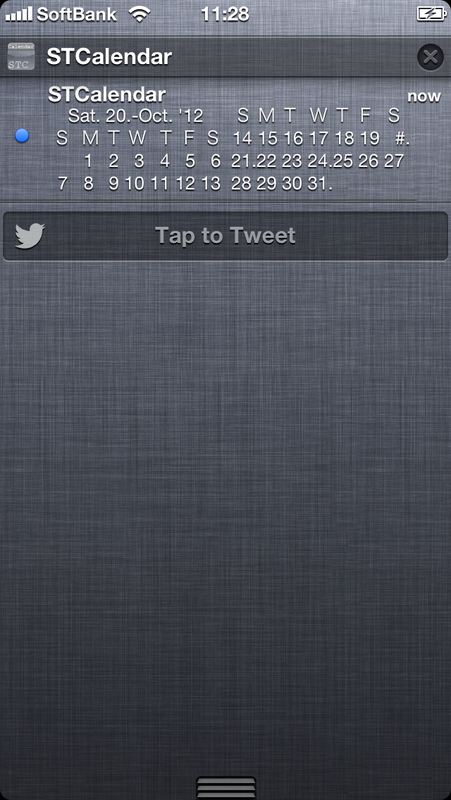 Anyone can get the full calendar on the Notification Center without jailbreak, and it is so easy! The user can be notified of those header or calendar events everyday at the usual fixed time. The calendar at the time of the notice will displayed in two-columns. STCalendar is an app to notify you of the simple monthly calendar to the Notification Center of iOS. So, everyone can check full calendar from the Notification Center even if there isn't any reason for and even at anytime. * Notifications setting on iOS "Show" set "1 Recent item"
- Enabled to select "Header and full calendar" or "Header only"
- Enabled to select "text" or "date"
The calendar at the time of the notice is displayed in two-column and very simple. But, this application is very convenient, and I believe that it will make people happy. STCalendar 1.0 is only $0.99 USD (or equivalent amount in other currencies) and available worldwide exclusively through the App Store in the Utilities category. Located in Tokyo, Japan, Crazy Interactive was founded by Mayami Amayim. He is a student doing engineering department, the information systems in rural areas. He likes making things for cameras, electronics and he has created an iOS app. Copyright (C) 2013 Crazy Interactive. All Rights Reserved. Apple, the Apple logo, iPhone, iPod and iPad are registered trademarks of Apple Inc. in the U.S. and/or other countries. Other trademarks and registered trademarks may be the property of their respective owners.